The girls and I recently attended a baby shower for a family friend. This young mother has always loved handmade things so the girls and I set out to make some presents for her little boy who is due next month. At the suggestion of a friend, I made some burp cloths by sewing grosgrain or satin ribbon down the seam of a cloth diaper. The ribbon helps distinguish between a burpie and a regular cloth diaper as this mom was planning to use cloth and wraps. We also made a sweater vest and matching hat by using patterns from Heartfelt which a lovely book about upcycling felted wool sweaters into new pieces. Lastly, I knit a green toddler hat for next winter in some stashed yarn of Plymouth Tweed. I am sorry that the company stopped making this yarn because it has such fabulous hues and knits up beautifully. The simple pattern can be found here although I tweaked the bind off and did an i-cord for the knot at the top. The girls and I enjoyed making the little gifts to welcome another sweet baby boy into the world. It's been some time since I've had a baby boy and I enjoyed the crafting immensely! One thing that was an adjustment for me when we moved to the country two years ago was the lack of thrift stores. I was used to living in an inner ring suburb that had many thrift shops. 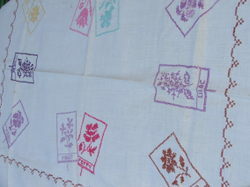 I love to go wandering around a Goodwill to find vintage linens, handknit baby sweaters and other treasures. The positive flip side of moving to the country is that there are a whole lot of antique shops. We have two or three on our town's square and there is a fabulous one in the neighboring village. I purchased an antique Jenny Lind toddler bed for Tess there the other day. 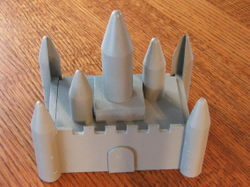 It is very sturdy and cost less than one of the plastic race car/princess types that can be found at Walmart. One thing that I've had no trouble finding at any of the local shops is redwork. I am so fond of redwork and I think it looks cheery any time of year. I found a vintage redwork crib-sized quilt a couple of days after I bought the bed. The shop owner said it was made in the 1930s but it could've been made a few years ago. 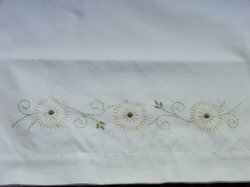 It is in wonderful condition and is not threadbare or stained in any way. I am pretty excited about the pair! Here's a closeup of some of the quilt squares. One wonderful book of redwork patterns is called Redwork from the Workbasket. It is a compilation of patterns from the crafting magazine The Workbasket, which boasts a sixty year history. I am working on a pattern for a pillow that reads "Sweet Dreams". I'll post photos as I progress. :) There are so many nice pattern books and many, many free patterns to be found online for people interested in redwork or embroidery in general. 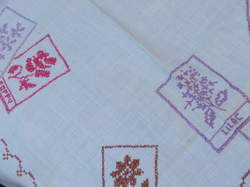 Do you do redwork embroidery? What are some of your favorite sources for patterns? I love to knit in January and February. The pressure to complete a project before Christmas has passed and the weather allows me to sit down on the sofa for a bit each day. Usually, a couple of little people snuggle up next to me or on my lap while I knit which makes the knitting a little more difficult but a much toastier experience. I have been reading Kate's blog for some time. She has a whole slew of fabulous and affordable patterns. I recently purchased both Owls and Owlet. I think the button eyes on the owls are so cute! I've not yet started the adult version but have the children's Owlet on the needles for little Tess. I allowed her to choose her yarn colorway from Knitpicks. She pointed her chubby little dimpled finger at the screen and chose Damson Plum which really looks more like the Blackberry colorway in real life. 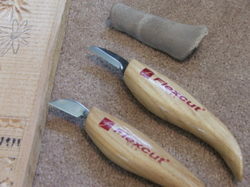 It is much deeper than the appearance of the photo on Knitpicks' site. I love the Swish Bulky because it is a superwash Merino--one of the softest I've felt. It knits up so nicely and feels great in my hands. I haven't gotten to the owl cable on the sweater yet, a couple of inches to go before I begin that part. I have never done any cable work before but am looking forward to creating those sweet little owls! I read quite a few good reviews about the Harmony Wood interchangeable circular needles before I purchased a set for myself. They're smooth and beautifully crafted. There isn't a rough spot to be found and the connections to the cables is almost seamless. Knitting with them has been a pleasure. Plus they are just so darn pretty! I also recently bought Georgie Hallam's Milo vest pattern. 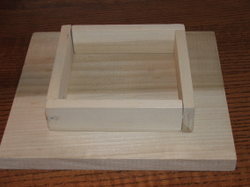 I am making one both for Annie and Tess. I bought Plymouth DK Superwash Merino for Tess'. There is no color name on the label but rather a number. The shade reminds me of a spring strawberry so that is what I'm naming it--Spring Strawberry. My Mary is growing to be a young lady and is almost out of children's sized clothing. I am looking forward to that transition because the older girls' department is much more difficult to shop than the ladies' section. I intended to make a Milo vest for her as well but the pattern is only up to a size 6. If any of you know of a similar ladies' sized pattern, please let me know. I hope you are all well and staying warm. The girls and I had a wonderful time making fairy houses in the woods the other day. We had only recently spent a lovely afternoon at Mary's godmother's home making tiny wooden and felt fairies. 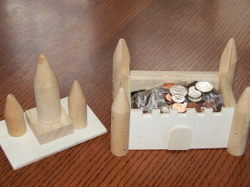 The girls decided that those little dolls ought to have somewhere to live. So the fairy homes were lovingly constructed.That project occupied Mary and Annie for several hours. They built the homes from rocks, bark, lichen, moss, much mud and many flowers. I thought you might like to see them. and even a fairy pond with lily pads. 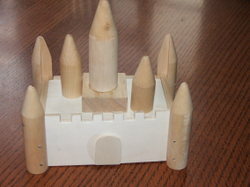 :) When given creative materials and a little inspiration, children can make such lovely things! Outside my window... bright sunshine on sparkling white snow. It appears we only have a few inches left that hasn't melted. And BIRDS! The beautiful sound of the birds singing as the sun came up this morning. Such a welcome sound that spring is on its way! I am thankful for.... recent acts of kindness, thoughtfulness and love. From the kitchen....chai, hot blueberry muffins, fresh fruit. I am creating.....quite a bit from upcycled felted wool sweaters: mittens, brooches, handbags and a lot of other fun things. Here's a bag I made for Mary Kathryn. I am wearing...charcoal grey warm up pants with a white stripe down the side, charcoal grey t-shirt, bare feet (sorry Flylady), a silver miraculous medal, a bracelet with my children's names engraved on it, little silver knot earrings. I am going...out to the garage to see if we caught a possum in the catch and release trap. I went out to put the cat away the other night and found a possum sleeping in the cat bed. Aaah! I am reading....The Shack by William P. Young. It was a Christmas gift. Not sure how I feel about it yet but I'll let you know when I'm done. I am hoping....for a few days of warm weather so I can paint the bedroom. I am painting it blue. And those of you who have been to my home know that is out of the ordinary. Because every room in my home(s) for the last fifteen years has been a warm shade of sage green, warm yellow or dark red. But blue is calling me and I am pretty excited to make the change. I am hearing ...the girls playing in their bedroom, the birds singing in the rhododendron bushes, Tess babbling her sweet baby sounds as she crawls around the room. Around the house ... spent yesterday cleaning the storage closet, organizing games and puzzles. We bought a high chair for Tessie and assembled it. Feels good to accomplish things in spurts as the baby gets a little older. One of my favorite things ...a photo of my grandfather's shop. More on that later. A few plans for the rest of the week: swimming at the YMCA, making potato kale soup, working on Mary's First Communion album, knitting when I can catch a chance. :) And happy that Ben is finished with his wrestling season so we'll be seeing more of him after school this week. popping in to say "hello"
I finally completed the Toasties for my sister-in-law. The pattern is from Leslie's site which is such a lovely place to visit. I have been knitting in spurts, a few minutes a day. Her birthday is next week and I am going to ship them off sometime soon. The good thing is that we have plenty of winter left here in Northeast Ohio. So I am hoping she is able to get some use out of them. I have started another pair for a different birthday gift, this time in charcoal grey. I'll post photos when I am further along. In other news, there have been some mighty sweet cowgirls running through the house, yelling "Giddyap" and generally creating a ruckus. Funny, I thought the Sheriff was supposed to bring about law and order. Apparently, not in these parts, badge or no badge. I hope you all had a relaxing weekend with your families. Thanks for stopping by this winter evening. It's a balmy 8 degrees here in Northeast Ohio. Balmy compared to yesterday's -11 degrees! We are used to Cleveland winters but it is pretty amazing when it gets so cold that your breath freezes in your nose after being outside for a few minutes. There has been a lot of tea brewing this weekend as I recently received my shipment from Adagio. Adagio has so many delicious teas but my favorites are the peppermint, spearmint, chamomile, Masala Chai, Jasmine #12 and Foxtrot. All of them smell heavenly while brewing and they taste so good on these chilly days. Today, I am drinking the chai with a splash of maple syrup. If you like Jasmine tea, the #12 is the best I have ever had, hands down. I love to watch the little buds unfurl in the hot water. Two or three of them make a delicious cup. No need for an entire teaspoonful, in my opinion. Because I had a chance to sit a spell late last night, I picked up my knitting again. Not working on the Tasha Tudor shawl as I should be. Instead, I started a pair of Toasties for two of my sister in laws who have February birthdays. Leslie has a very lovely, simple pattern posted on her blog "a Friend to knit with". I am using Debbie Bliss' Donegal Luxury Tweed which is 85% wool and 15% angora. It is just enough angora to make the wool ever so soft. I am fond of angora though I don't like the mess it leaves behind. This is just a touch of angora so it doesn't have the fuzzy effect. This afternoon, I have floors to sweep and laundry to do but, this evening, we will be here knitting, sipping and playing games by the fire. I hope all of you are warm and well. There is downy snow falling outside my window. 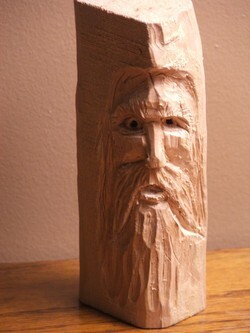 I am sipping on my third, maybe fourth cup of cinnamon tea from a potbellied mug I received for Christmas. We are on the mend here, having been sick for a few days. Yesterday, I got dressed for the first time in four days. Our visiting family members left on Sunday, drove back to Virginia. A couple of people from both families fell ill during the visit but most of us are doing much better now. They had been here for ten days and Oh what fun we had! It was so nice for the cousins to play without having anywhere to be but together. The grownups spent a lot of time catching up, staying up late, chatting and cracking jokes. We even got out to the movie theatre, something I only do once every few years. Today, we spent the morning taking down the Christmas decorations, packing away all the greenery, lights and wooden cranberries. Gone are the ornaments, Advent candles and manger. This day is always bittersweet for me because I love the color and festivity that Christmas adds to our home. When the decorations come down, it always looks a little stark. Thankfully, there are Christmas presents to make us smile, warm food for our bellies and a fire on the hearth. There are new books to read and things to make. This is my favorite time of year for crafting. The pressure to complete something by Christmas has passed and my creative mind works much more freely in the winter months. I am reading and enjoying a few new books. One is called Sock Doll Workshop by Cindy Crandall-Frazier. 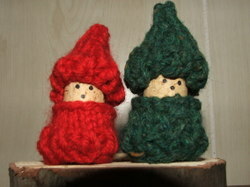 I went to a craft fair before Christmas at our old parish and bought a couple of little sock dolls. They were so sweet and I wanted to learn how to make them. Also, since making Annie's sock monkey last year, I've been intrigued to learn how to make some different animals. Miyako Kanamori has two books Sock and Glove and Happy Gloves which are full of simple, sweet plans to make a variety of little creatures. So those dolls and creatures are my craft plans for this winter, along with picking up some neglected knitting. Well, that's all for now. Thanks for visiting and many blessings to you on this wintery evening. Many thanks to those of you who have written asking how the move is going. It is coming along very nicely. We have been moving boxes to the new house all this past week, two or three vanloads each day. I've been able to unpack just about everything we have moved over thus far. We'll be getting a truck this weekend to move the furniture and the last of the household items. A friend is so kindly watching the girls on Saturday and my friend Maura has provided a chicken stir fry for dinner tonight. Mom is making a huge pot of chili and some cornbread muffins for Saturday's dinner. Mike's brother and two of his sisters are arriving in town this weekend to help with the move. We are very blessed to be surrounded by so many kind friends and family members. I have been purging the old house as well as packing. Some of the things I have gone through have been emotional for me as I had about ten boxes of things that belonged to my father who died in 2001. They have sat on an upper shelf in my basement since then, unopened. Today, I knew it was time to deal with them both literally and emotionally. My dad was a master model shipwright and I inherited his extensive library of shipbuilding and Great Lakes books. I intend to sell or donate most of them in the upcoming weeks and did not plan to open those taped boxes labelled "Dad's books" but, rather, planned to move them to the new house until I could sort them out. 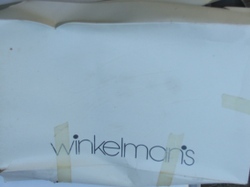 Yup, a beat up old Winkelman's clothing box. Anyone remember Winkelman's? You might be wondering what was wrapped inside that box. 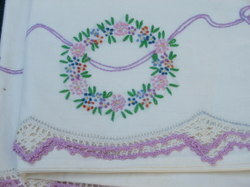 An entire box of hand embroidered table and bed linens made by my father's maternal grandmother! Can I tell you how I shrieked aloud with GLEE?!? They must have been passed down to my father (who never used them or displayed them). 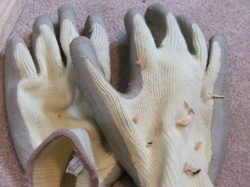 My great grandmother died in the mid 1960's so that gives you a time frame as to the last time they were used. Her initials are on some of the items. Perhaps my dad wrapped them in tissue and stuck them in this box. When he died and his apartment was packed up, someone put them in a box of books. It certainly wasn't me as I have never seen them before. They were all crisply pressed and folded neatly. Even the folds were pressed as was common back then. Here are some closeups for your enjoyment. 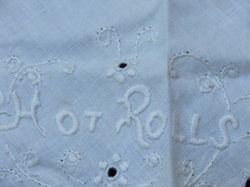 A cross shaped basket liner embroidered with "Hot Rolls"
I just can't tell you how excited I am about this. It was such a nice surprise amidst the boxes, dust, hustle and bustle. Funny thing is that my house is fairly modern. Not in a black and mirrors kind of way but sort of a Pottery Barn meets Tuscany sort of way. 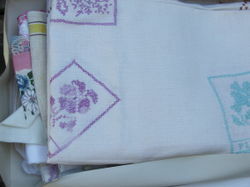 Not sure how these linens will meld with that but I am determined to find a way to work a few of them in. 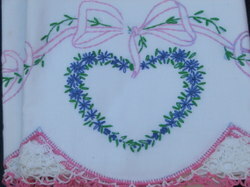 The pillowcases will go beautifully in the girls room, which is rather girly and cheerful. Still mulling over the rest of them. 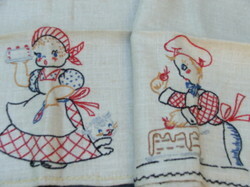 I am currently working on two sets of embroidered pillowcases. 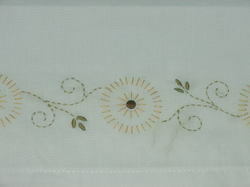 Here is one pillowcase I completed for my sister in law and her new husband. Their bedroom color scheme is earth toned with a bit of butter yellow mixed in. The other set is for my friend Anne whose birthday was in, (ahem), May. She is a very patient friend. :) Perhaps if I could work on them more than three minutes a day, I might have had them completed by now. 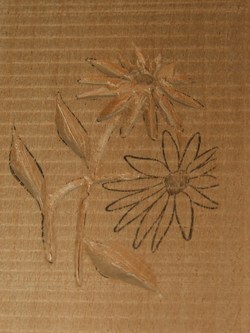 Anne's are the same pattern, only darker flowers to match her bedroom. I bought the pillowcases and pattern in a kit at the local craft store. 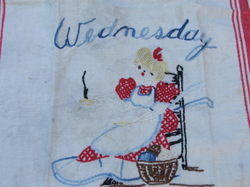 It is the first embroidery project that I've completed since I was a very young girl. I think they are pretty and cheery. Mary Kathryn has had some sort of stomach virus for the past two days. She has been in and out of sleep. When she is awake, the most energy that she can muster is to sit up in her bed propped by pillows. This has made for a bit of a dull time for her so I decided to teach her to embroider to pass some time. 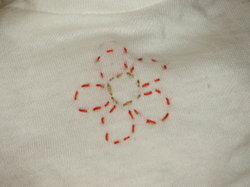 I drew a little flower pattern in pencil on the front of a $1.50 doll t-shirt from our local craft store. She followed the pattern and learned the running stitch. 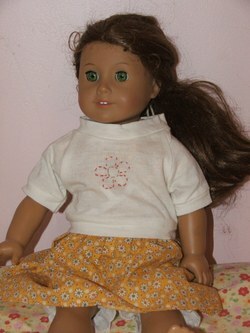 Mary is so excited to have completed a new shirt for Miss Felicity. My birthday was a couple of weeks ago. 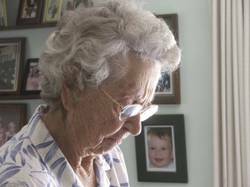 My grandmother Kathryn called on that day to tell me that she had a special gift for me but that she was unable to get to the post office on time. I was so curious as to what she was sending. Imagine my delight when I came home from the store today to find Grandma's package had arrived! 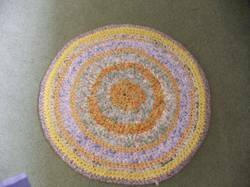 I opened the box and inside I found this beautiful, handmade crocheted rug. It is about three feet in diameter and is such a pretty combination of colors. Those of you who used to read my previous blog (of the same name) might recognize this rug from a post I wrote after visiting my grandmother last spring. My grandma remembered how much I loved her rugs and saved it for my birthday. I am completely giddy over her gift! I think I will put it in the girls' room which has a pink, yellow and white color scheme and where it won't see heavy, dirty traffic. 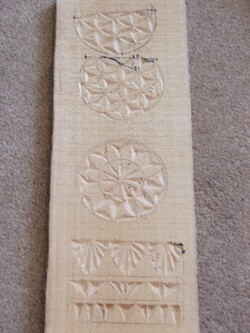 I am determined to get down to Florida sometime this year and learn, firsthand, how to make one of these beautiful rugs. She showed me a bit while I was there but I did not get the hang of it very well. Here is a photo of Kathryn taken last spring. And another of her hands fixing Mary's hair. I am so grateful to have Kathryn as my grandmother. 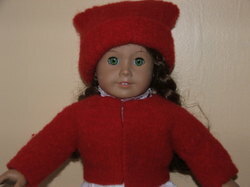 Miss Felicity is modeling a festive felted wool sweater and hat made using a pattern from the very creative Alice. The set is a present for Mary who received Felicity for Christmas last year. Now, to search for the bag containing the brass buttons for the front of the sweater! I've yet to add the ribbon for hanging. Here is the pattern. I think they are so darn cute.